Montgomery totaled eight points (3-11 FG, 2-8 3Pt), three rebounds and two assists during the Dream's playoff loss against Washington on Sunday. Montgomery had a rough shooting outing in the loss Sunday, recording just eight points while shooting 27.3 percent from the floor including a two-of-eight mark at the three-point line. During the 2018 regular season, the 32-year-old veteran added 10.3 points and 3.7 assists across 34 appearances. Montgomery managed nine points (3-12 FG, 1-9 3Pt, 2-2 FT), four assists, three rebounds, and one steal during the 89-74 home victory against Chicago on Friday. It was a rough shooting performance for Montgomery during the win Friday, as she was only able to drain three-of-12 from the field including an awful one-of-nine at the three-point stripe. Currently across 27 appearances, the 27-year-old is adding 9.6 points and 3.4 assists per game. Montgomery had 10 points (2-10 FG, 2-9 3Pt, 4-5 FT), three assists and one rebound during Friday's 95-86 loss against Seattle. Montgomery had a rough shooting night in the loss Friday, shooting a mere 20.0 percent overall including a two-of-nine performance from the three-point line. Over 17 contests this season though, Montgomery is adding 9.5 points which is her highest average since the 2013 season. Montgomery provided 19 points (7-9 FG, 5-7 3Pt), five assists, two rebounds and one steal during the 93-80 loss at Chicago on Wednesday. Montgomery led the Dream in scoring Wednesday thanks heavily to her superb performance from behind the arc, converting five-of-seven three-point attempts. So far through 14 games this season, the 32-year-old is shooting the three-pointer at her best percentage (37.3 percent) since the 2011 season. Montgomery had 12 points (4-16 FG, 2-12 3Pt, 2-2 FT), one rebound, one assist and one steal in the 79-72 loss to the Liberty on Sunday. Despite reaching double figures with 12 points, Montgomery struggled mightily from three-point range, shooting just 16.7 percent across 12 attempts. The UConn product is now averaging 9.3 points across 12 outings which is the most she has averaged since her 2013 campaign though. Montgomery had six points (2-6 FG, 2-6 3Pt), three rebounds, three assists and two steals in Thursday's 72-67 win over Indiana. Despite shooting just 33.3 percent from three-point range Thursday, Montgomery lead the Dream in three-pointers made as she finished with six points across 31 minutes. The ninth-year guard is averaging 8.8 points, 2.9 assists and 2.2 rebounds across the first 10 games this season. Montgomery finished with 12 points (3-6 FG, 1-2 3Pt, 3-3 FT), four rebounds, two steals and two rebounds during the 82-77 victory over Connecticut on Tuesday. This was Montgomery's third consecutive game scoring in double figures as she was able to reach the 12-point mark on 50 percent shooting overall and a three-of-three performance from the line. The former UConn guard is currently the third-leading scorer on the Dream this year with 10.7 points per contest. Montgomery recorded 14 points (4-9 FG, 4-6 3Pt, 2-2 FT), three rebounds and two assists in Sunday's 78-71 loss to the Mercury. Montgomery was by far the best three-point option for the Dream on Sunday, as she drained four-of-six from deep while reaching the 14-point plateau. In five starts so far in 2018, the 32-year-old guard is averaging 10.4 points which is considerably more than than the last three seasons. Montgomery added 14 points (5-9 FG, 3-6 3Pt, 1-1 FT), seven assists, three steals, three rebounds and one block during the Dream's 78-61 preseason victory over the Sky on Sunday. Montgomery had a strong opening performance with her new team by shooting a fine 55.6 percent from the floor while adding at least one tally in each of the major statistical categories. The 31-year-old averaged 8.0 points, 3.4 assists and 1.6 rebounds last year with Minnesota and it won't be surprising if she can keep that pace up with the Dream this season. Montgomery is a 10-year veteran who spent most of her career with Minnesota, winning a pair of championships with the team in 2015 and 2017. Last season, she averaged 7.0 points, 1.9 assists and 1.3 rebounds per game while shooting over 35 percent from beyond the arc. Selected by Minnesota in the 1st round (4th overall) of the 2009 WNBA Draft… Acquired by Connecticut, along with a 1st-round pick (1st overall) in the 2010 WNBA Draft, in exchange for Lindsay Whalen and a 1st-round pick (2nd overall) in the 2010 WNBA Draft on Jan. 12, 2010… Re-signed to a three-year contract on Feb. 5, 2013… Acquired by Seattle, along with 1st- and 2nd-round picks (3rd and 15th overall) in the 2015 WNBA Draft, in return for Camille Little and Shekinna Stricklen on Jan. 28, 2015… Acquired by Minnesota, along with a 2nd-round pick in the 2016 WNBA Draft, in exchange for Monica Wright on July 20, 2015… Re-signed to a two-year contract on Feb. 2, 2016. Started the final 12 games of her fourth season with the Lynx, and appeared in every contest for the seventh time in her nine-year WNBA career… Averaged 8.0 ppg, 1.6 rpg and 3.4 apg in 21.8 mpg while shooting a career-best 42.4% from the field, 84.2% from the FT line and 35.8% (39-for-109) from beyond the arc… As a starter, she hiked those figures to 9.7 ppg (47.7%) and 4.1 apg in 29.5 mpg while hitting 42.9% (21-for-49) from long range… Netted a season-high 21 points Sept. 1 vs. Chicago, her third 20+ night of the year (19th career) and one of 10 double-digit efforts… Led Minnesota in assists on eight occasions, including a season-best eight assists Aug. 25 at San Antonio; the five TOs in that game tied a season high… Put in 20 points Aug. 18 vs. Indiana, going 5-for-7 from three-point distance; the six rebounds marked her top total since 2013… Logged a season-high 38:14 vs. Los Angeles on Aug. 11, part of a five-game stretch that saw her average 34.2 mpg… Erupted for 20 points (with a season-high three steals) July 6 vs. Los Angeles, the top total by a Lynx bench player since Natasha Howard scored 21 vs. San Antonio last July 2 and her best scoring night since tallying 25 for Connecticut vs. Phoenix on Sept. 7, 2012. 2016: Again played all 34 games in her eighth WNBA campaign (third with the Lynx); she’s missed just 12 games in her career, with 11 of those coming in 2013… Averaged 7.5 ppg, 2.8 apg and 0.97 spg in 19.3 mpg, shooting 39.7% from the field, 32.1% (27-for-84) from three-point distance and 82.8% from the FT line… Netted 8.9 ppg through June, but slipped to 6.2 ppg after July 1… Started a pair of games, logging a season-high 32:52 in the Sept. 13 contest at Chicago… Scored her 2500th career point July 15 vs. New York; the game was also the 250th of her WNBA career… Led the Lynx with 15 points June 26 at Washington, one of 11 double-digit nights… Hit the game-winning three-pointer with :02.9 to play June 21 at Los Angeles… Tied her career best with the game-high 10 assists June 19 at Seattle, and scored a season-high 18 points June 7 vs. Phoenix… Equaled her career high with five steals both May 18 at Chicago and May 14 vs. Phoenix, but picked off just seven steals over her final 17 games (26 in the first 17). 2015: Returned to Minnesota midseason, having started the year in Seattle… Saw action in 36 games overall, tying Katie Smith’s league record (set in 2005) for a single season… Averaged 6.4 ppg, 1.5 rpg and 2.8 apg in 17.9 mpg, shooting 37.2% from the floor and a career-low 30.8% (33-for-107) from long range… Shot 23.2% (13-for-56) from beyond the arc in Minnesota, having fired at a 39.2% clip with the Storm; her Lynx averages were 5.7 ppg and 2.5 apg in 19 games… Started seven games overall (five with the Lynx); she logged a season-high 38:28 vs. New York on Sept. 6… Dealt nine assists July 31 vs. Atlanta, her best since a career-high 10-assist night vs. New York in 2011… Acquired from Seattle on July 20, along with a 2nd-round pick in the 2016 WNBA Draft, in return for Monica Wright… Scored a season-high 19 points June 6 vs. L.A.… 2014: Completed her fifth season in Connecticut by seeing action in 33 games off the bench, drawing one DNP (May 23 vs. Seattle)… Tallied a career-low 6.7 ppg and 2.4 apg while logging 16.3 mpg; she shot 37.3% from the field, 33.0% (35-for-106) from three-point range and 77.5% (31-for-40) from the line… Put together a run of 12 consecutive games with a made three-pointer (July 1-Aug. 3)… Reached double figures on six occasions, posting season highs with 18 points and three steals June 1 vs. Atlanta… Handed out a season-best seven assists July 27 vs. Minnesota; the minute total in that game (27:33) was also a season high. 2013: Appeared in 23 games (including 18 starts) for Connecticut in 2013, missing 11 (June 1-July 14) due to a sprained left ankle… Tallied 10.1 ppg (36.5%) and 3.1 apg in 27.1 mpg while hitting 32.7% (36-for-110) from beyond the arc and a career-best 89.7% (35- for-39) from the line… Chipped in a season-high 18 points Aug. 3 at New York, the first of 12 double-figure scoring nights… Scored 16 points with a season-best eight assists in the Sept. 15 finale vs. Indiana… 2012: Won the 2012 WNBA Sixth Woman of the Year award following a season in which she helped Connecticut to a 25-9 record and first place in the Eastern Conference… Came off the bench in all 34 games, averaging 11.6 ppg and 2.6 apg in 24.0 mpg; she shot 36.4% (47-for-129) from long range and 84.8% (117-for-138) from the line… Tacked on 6.8 ppg (39.3%) and 3.4 apg in five postseason appearances as the Sun reached the Eastern Conference Finals… Pumped in a season-high 25 points vs. Phoenix on Sept. 7, and added 23 points vs. San Antonio on May 25… 2011: Her 2011 campaign was highlighted by her first All-Star Game selection; she finished with 12 points in the East’s 118-113 victory on July 23 in San Antonio… Started all 34 games for Connecticut, tallying a career-best 14.6 ppg and 4.9 apg – the latter ranking 3rd in the WNBA – in 29.1 mpg… Shot a career-high 38.4% (61-for-159) from three-point range and 82.9% from the line; she finished 5th in FTs made with 126… Tied her career best by erupting for 33 points (in a career-high 43:22) at Chicago on June 23, going 6-for-8 from beyond the arc, and added 28 points Aug. 7 at Phoenix… Chipped in 13.0 ppg and 4.5 apg in two playoff outings… 2010: Played in all 34 games in 2010. Averaged 13.3 ppg and 4.1 apg in 27.6 mpg, hitting 40.1% from the field, 34.9% from long range and 85.5% from the line… Poured in a career-high 33 points Aug. 3 at Minnesota and followed up with 22 points and a career-best 10 assists two nights later in Seattle… 2009: Completed her rookie season in Minnesota by playing in all 34 games, including nine starts… Averaged 9.0 ppg, 1.9 rpg and 2.1 apg in 22.5 mpg, shooting 40.8% from the floor, 34.7% (42-for-121) from three-point range and 83.3% from the line… Reached double figures on 11 occasions… Pumped in a season-high 24 points Aug. 7 vs. Connecticut and added 21 points vs. Washington on July 7… Registered season bests with six rebounds and seven assists July 15 vs. Atlanta. 2017: Earned her second WNBA championship by appearing in all eight playoff games and averaging 7.0 ppg (44.9%) and 1.9 apg in 17.1 mpg… Contributed a playoff career-high 18 points in the Game 1 win vs. Washington on Sept. 12… 2016: Averaged 4.1 ppg while playing in all eight postseason games… 2015: Played in all nine postseason games for the Lynx, averaging 3.7 points… Won her first WNBA title as the Lynx defeated Indiana to win their third WNBA Championship… 2012: Played in all five postseason games for Connecticut, averaged 6.8 ppg and 3.4 rpg… Dished a playoff career-best seven assists in the Oct. 5 victory over Indiana… 2011: Started Connecticut’s two postseason games and averaged 13.0 ppg and 4.5 apg. 2016-17: Played for Basket 90 Gdynia in Poland…Averaged 18.0 ppg, 5.2 apg and 3.9 rpg in 11 games… 2015-16: Spent the winter in Australia playing for WNBL club Canberra, averaging 14.9 ppg (40.5%), 3.1 rpg and 4.0 apg in 19 outings… 2014-15: Spent the winter playing for Russian club Vologda-Chevakata, averaging 14.2 ppg (40.9%), 3.7 apg and 2.17 spg in 24 Premier League starts… Also contributed 16.0 ppg (49.0%), 5.8 apg and and 2.25 spg in eight EuroCup appearances… 2013-14: Saw action in 10 Premier League games for Vologda-Chevakata, netting 15.4 ppg (41.1%) and 2.8 rpg… Began the winter with Turkish club Tarsus, where she averaged 9.8 ppg (34.5%) and 2.4 apg in nine TKBL contests and added 12.6 ppg (46.3%), 4.8 apg and 2.20 spg in five EuroCup starts… 2012-13: Averaged 11.5 ppg (35.7%) and 3.4 apg in 25 Premier League appearances for Nadezhda Orenburg… Also collected 13.5 ppg and 3.0 apg in 13 EuroLeague contests… 2011-12: Played for Hungarian club Uni Seat Györ, tallying 16.0 ppg in three EuroLeague appearances… 2010-11: Spent the winter with Maccabi Ashdod in Israel, averaging 17.8 ppg and 3.8 apg in 28 contests… 2009-10: Debuted in Europe with Lithuanian club TEO Vilnius, netting 14.3 ppg and 3.8 in nine LMKL outings and 17.6 ppg and 3.9 apg in eight EuroLeague starts. 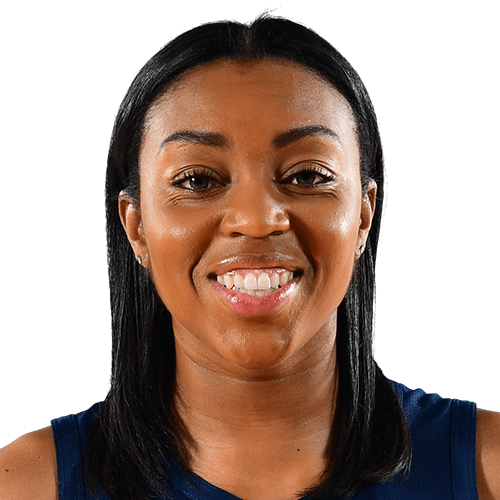 Full name is Renee Danielle Montgomery… Parents are Ron and Bertlela Montgomery… Born Dec. 2, 1986 in St. Albans, W.Va.… Communications major… Spent the 2009-10 offseason with ESPN as a color commentator during NCAA Women’s Basketball games.